A mafia of advertising agencies is enjoying the liberty of defying laws under the patronage of politicians, as is evident from an "illegal" advertisement of World Cup Kabaddi put up by Paras Mani Land Promoters Pvt Ltd on the hoarding of the forest department's land. An illegal advertisement of the World Cup kabaddi final put up on the hoarding owned by the forest department. Photo: Inderjit Verma . Two days after a woman was found hanging from a ceiling fan at her residence in Kailash Nagar near Sherpur Chowk in Focal Point, the police today booked her husband and in- laws in a dowry death case. Parents of several students of Green Land Senior Secondary Public School, located on the Jalandhar bypass here, today gathered at the school to lodge a protest against school officials for allowing junk food to be sold in its canteen. The angry parents, later alleged they were not allowed to meet the school’s principal or its chairman. The final of the Kabaddi World Cup, to be held at Guru Nanak Stadium here this evening, has kept personnel of the district administration, the municipal corporation (MC) and the police on their toes for the past one week to make it a success.The deceased, Simranjit Kaur, was married to Amandeep Rampal, who works as a travel agent in Jalandhar, six years ago and had two children out of the wedlock. As the mystery over the missing file of 400 square yards in the posh Rajguru Nagar developed by the Ludhiana Improvement Trust (LIT) still remains unsolved even two weeks after the execution of conveyance deed in violation of the rules, a city-based NGO Public Cause has demanded a vigilance probe to unearth the truth so as to check the recurrence of such instances, which have become common and also to bring the culprits to book. Wheat spread over 6 acres of land was gutted in fire at Hawas village on the Rahon road here this morning. A rally was held by the BSNL Casual and Contract Workers Union (AITUC) near the BSNL office, Bharat Nagar Chowk, here today, in which at least 1,000 workers participated. More than 16 trade unions also participated in the rally to support BSNL workers. Security agencies have stepped up vigil to avoid any eventuality over the proposed unbundling of the PSEB following orders of the state government. City women's love for exquisite Pakistani designer wear was at its zenith during fashion exhibition 'The Woman-2010' held here recently. The creations of Heena Anjum, a fashion designer from Karachi, were instantly lapped up by women of all ages who crowded around the stall on all three days of the expo to pick designer salwar-kameez in their favourite shades, fabrics and styles. Elections to the post of Knitwear Club president will be held on April 16, with Vinod Thapar and Ajit Lakra vying for the chair. Thapar has been heading the club since 2000. The PSEB Employees Federation and the Technical Service Union took out a protest march here today and submitted a memorandum to the executive magistrate. "The violation of Pre-Conception and Pre-Natal Diagnostic Techniques Act 1994 (PC & PNDT Act) will be dealt with sternly," said Dr Satwant Bhalla who took over as the new Civil Surgeon of Ludhiana today. New Hope, an NGO, celebrated Baisakhi at Swami Vivekananda Vridh Ashram here today.NS Nanda, president of the NGO, presided over the function, while Ram Prakash Bharti, chairman of the trust, was the guest of honour on the occasion. Bal Bharati Public School, Dugri, celebrated Baisakhi with fervour here today.The celebrations started with giddha performed by pre-primary kids. 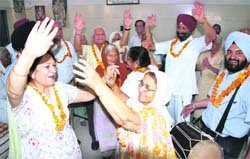 The festival of Baisakhi instills a pure sense of joy and enthusiasm in the northern parts of India, particularly Punjab. Panic gripped Bhai Bala Chowk after some commuters spotted a bag on the roadside.The incident took place at 10 am, when some commuters found a black bag lying unattended and raised an alarm. Five unidentified youths attacked three students, injuring one of them seriously, and snatched mobile phones and cash from them at the Kitchlu Nagar market last evening. The injured student was identified as Ankit Bansal (17), a resident of Tagore Nagar. He sustained a serious head injury and was admitted to the DMC hospital. Sandeep Kaur reportedly committed suicide by setting herself on fire after sprinkling kerosene on her clothes at Baharsinghpura village, near here, last night. Jasbir Kaur has accused her husband Harpreet Singh of Punia village, near here, his elder brother Harjit Singh, mother Surinder Kaur and Harjit’s wife Kuljit Kaur of torturing her physically and mentally to bring more dowry. The spirit of kabaddi was missing as the crowd was gathered forcibly at Guru Nanak Stadium, venue of the Kabaddi World Cup final, here today.The event was being promoted as the first-ever initiative of the Punjab government to promote the sport, with the Chief Minister and his deputy taking all credit for it. Losing their position in the Kabaddi World Cup has evoked no regret from organisers and players of the Canadian team. Led by Kulwinder Singh, they are happy for having attracted the maximum attention of sports lovers from their respective native villages for the past few days. 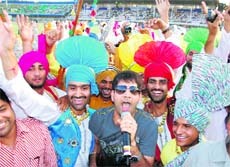 A galaxy of Bollywood stars converged on the city during the final match of the World Kabaddi Cup.